The QWebView class provides a widget that is used to view and edit web documents. 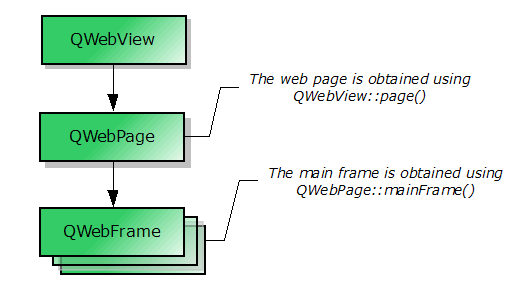 QWebView is the main widget component of the QtWebKit web browsing module. It can be used in various applications to display web content live from the Internet. 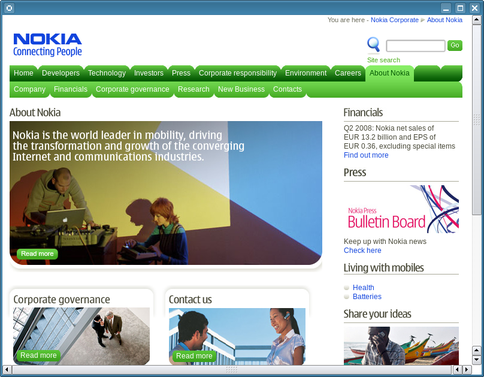 The image below shows QWebView previewed in Qt Designer with the Nokia website. Alternatively, setUrl() can also be used to load a web site. If you have the HTML content readily available, you can use setHtml() instead. The loadStarted() signal is emitted when the view begins loading. The loadProgress() signal, on the other hand, is emitted whenever an element of the web view completes loading, such as an embedded image, a script, etc. Finally, the loadFinished() signal is emitted when the view has loaded completely. It's argument - either true or false - indicates load success or failure. The title of an HTML document can be accessed with the title() property. Additionally, a web site may also specify an icon, which can be accessed using the icon() property. If the title or the icon changes, the corresponding titleChanged() and iconChanged() signals will be emitted. The textSizeMultiplier() property can be used to change the overall size of the text displayed in the web view. If you require a custom context menu, you can implement it by reimplementing contextMenuEvent() and populating your QMenu with the actions obtained from pageAction(). More functionality such as reloading the view, copying selected text to the clipboard, or pasting into the view, is also encapsulated within the QAction objects returned by pageAction(). These actions can be programmatically triggered using triggerPageAction(). Alternatively, the actions can be added to a toolbar or a menu directly. QWebView maintains the state of the returned actions but allows modification of action properties such as text or icon. A QWebView can be printed onto a QPrinter using the print() function. This function is marked as a slot and can be conveniently connected to QPrintPreviewDialog's paintRequested() signal. If you want to provide support for web sites that allow the user to open new windows, such as pop-up windows, you can subclass QWebView and reimplement the createWindow() function. QWebView consists of other objects such as QWebFrame and QWebPage. The flowchart below shows these elements are related. Note: It is possible to use QWebPage and QWebFrame, without using QWebView, if you do not require QWidget attributes. Nevertheless, QtWebKit depends on QtGui, so you should use a QApplication instead of QCoreApplication. See also Previewer Example and Browser. This property holds the icon associated with the web page currently viewed. By default, this property contains a null icon. See also iconChanged() and QWebSettings::iconForUrl(). This property holds whether the document was modified by the user. Parts of HTML documents can be editable for example through the contenteditable attribute on HTML elements. See also findText() and selectionChanged(). This property holds the scaling factor for all text in the frame. By default, this property contains a value of 1.0. This property holds the title of the web page currently viewed. This property holds the url of the web page currently viewed. Setting this property clears the view and loads the URL. By default, this property contains an empty, invalid URL. See also load() and urlChanged(). Convenience slot that loads the previous document in the list of documents built by navigating links. Does nothing if there is no previous document. See also forward() and pageAction(). See also selectedText() and selectionChanged(). Convenience slot that loads the next document in the list of documents built by navigating links. Does nothing if there is no next document. See also back() and pageAction(). This signal is emitted whenever the icon of the page is loaded or changes. Loads the specified url and displays it. Note: The view remains the same until enough data has arrived to display the new url. See also setUrl(), url(), and urlChanged(). Loads a network request, request, using the method specified in operation. body is optional and is only used for POST operations. See also url() and urlChanged(). This signal is emitted every time an element in the web page completes loading and the overall loading progress advances. This signal tracks the progress of all child frames. The current value is provided by progress and scales from 0 to 100, which is the default range of QProgressBar. See also loadStarted() and loadFinished(). See also loadProgress() and loadFinished(). Returns a pointer to the underlying web page. Returns a pointer to a QAction that encapsulates the specified web action action. Prints the main frame to the given printer. See also stop(), pageAction(), and loadStarted(). Sets the content of the web view to the specified content data. If the mimeType argument is empty it is currently assumed that the content is HTML but in future versions we may introduce auto-detection. External objects referenced in the content are located relative to baseUrl. See also load(), setHtml(), and QWebFrame::toHtml(). Sets the content of the web view to the specified html. External objects referenced in the HTML document are located relative to baseUrl. See also load(), setContent(), and QWebFrame::toHtml(). Makes page the new web page of the web view. The parent QObject of the provided page remains the owner of the object. If the current document is a child of the web view, it will be deleted. Returns a pointer to the view/page specific settings object. Convenience slot that stops loading the document. See also reload(), pageAction(), and loadFinished(). This signal is emitted whenever the title of the main frame changes. Triggers the specified action. If it is a checkable action the specified checked state is assumed. The following example triggers the copy action and therefore copies any selected text to the clipboard. This signal is emitted when the url of the view changes. See also url() and load().